Rename “Object” to “Choose Object”. Added images to combobox in advanced panel. Object choice in 1st panel with images, with mass readout (no name, here). Accel, velocity, position graphs should be black, not red, green, blue. FBD Button needs to look more like buttons (less like rectangles or titles). Move FBD Net Force graphic up, (not below). Rename “Net Force” à “Total Force”, and FBD arrow should be Ftot. Cursor should be disabled on record. Recording motion, then pausing and rewinding causes an incorrect artifact in the force arrows. (and actual model). Clearing readouts on the graph. Resetting the state of the leaner. Sometimes a heavy object slowing down will make the force arrows (and forces) flicker back and forth before coming to rest. This can also happen by increasing gravity on a moving object. I fixed this by forcing the object to come exactly to rest when changing direction (so static friction kicks in). This seems to fix it. Disabling net and friction force (via checkboxes) should clear the graphs. Fixed a bug that caused the text on arrows (on the object) jump around. 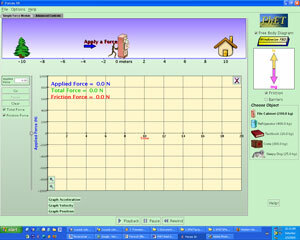 Turning on Net and other friction checkbox on the left while Force graph is suppressed has the wrong behavior. Chris says force1d doesn’t run on a Mac. Adding barriers during a recording session has the wrong behavior on playback.